Health indicators in Nigeria are some of the worst in the world and malaria is a key factor. In 2008 malaria accounted for 60 percent of outpatient visits and was responsible for 30 percent of deaths in children under five. The disease was also a major cause of absenteeism and low productivity. Despite the availability of efficacious preventive and treatment measures for malaria, inadequate funding and weak health systems limited their roll-out at scale and significantly reduced efforts to achieve universal coverage. At the time, modest anti-malaria initiatives being implemented were also not optimised due to lack of appropriate health seeking behaviour among the Nigerian populace. For these reasons, the UK government, through the Department for International Development (DFID), awarded GBP 89 million to implement the Support to National Malaria Programme (SuNMaP) from 2008 till 2016. Led by Malaria Consortium, with GRID Consulting and Health Partners International, the programme’s purpose was to reach the general population, especially the poorest and most vulnerable, with evidence-based interventions that would help control the disease and reduce the malaria burden. The programme focus was to support government malaria control efforts by providing technical assistance for building the National Malaria Elimination Programme (NMEP) and State Malaria Elimination Programmes (SMEPs), and building capacity of local government areas (LGAs) in service delivery and health programme management. SuNMaP would also provide antimalarial commodities to bridge commodity gaps and implement activities to increase demand for these commodities. It also fostered harmonisation of Roll Back Malaria partners' efforts, coordination of all theirs of government and sectors including private sector and support initiative aimed at growing antimalarial commodity market to be able to provide appropriate and affordable antimalarial services and commodities. SuNMaP also linked up with local and international implementing partners that had broad community-based networks to help implement demand creation activities, as well as those that supported research or commercial sector programmes. At the time of its conclusion, the programme was in 10 states: Lagos, Anambra, Kano, Niger, Ogun and Kaduna, Jigawa, Enugu, Katsina and Yobe covering 40 percent of the Nigerian population. Using a broad based approach of supporting the achievement of the national malaria strategic targets, SuNMaP made significant strides in stemming the tide of the malaria burden in Nigeria by working with government, RBM partners and stakeholders in the country to drafting or adapting effective strategies finalised with its resources and pulling all partners resources for national wide roll-out with the aim of achieving universal coverage. SuNMaP aimed to demonstrate new ways of working, using evidence of what has and has not worked in Nigeria and elsewhere. The intention was to achieve long-term, sustainable gains. The figure illustrates how SuNMaP’s six outputs were interrelated. 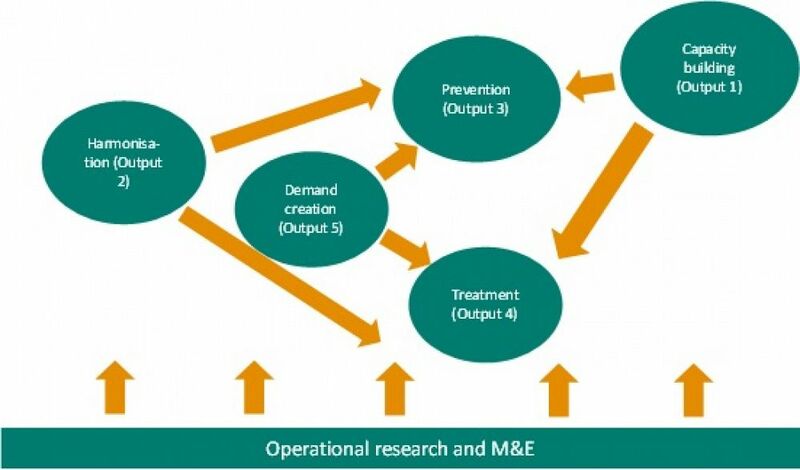 The sixth output is operational research and monitoring and evaluation, which underpins all of SuNMaP’s activities. The SuNMaP programme ends in March 2016.